The default extensions in 8x8 Virtual Office start at 1001. The Change Extension Numbers feature allows you to change a selected individual extension number, or customize multiple extensions at once. 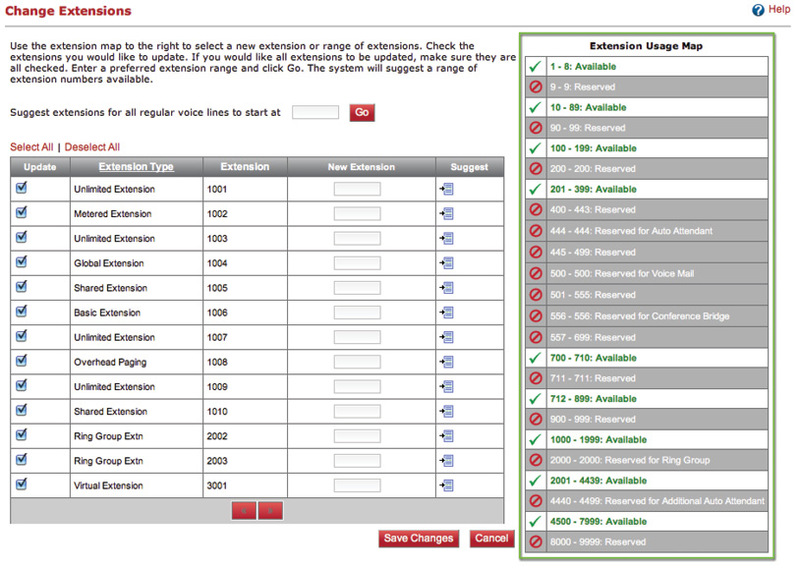 You can change the extensions to eight-digit numbers, for example, or start at 2001. You can enter a new extension number, or simply use auto-suggest for the system to suggest one. The Extension Usage Map on the right side of the screen provides a list of available and reserved extensions for your reference. 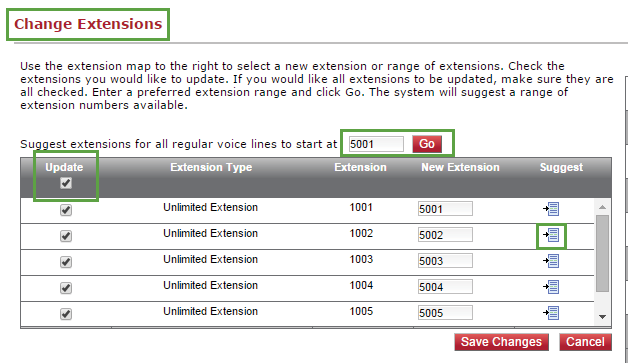 Refer to the Extension Usage Map to see available extension numbers. Deselect all extensions by selecting the Update check box. Enter a starting number in the field provided, and click Go. We suggest regular voice lines start at 5001. Note: Only regular lines are changed. Shared Lines, Call Queues, and Ring Groups must be changed individually. Select the check box next to the extension(s) you want to change. Enter an available number in the New Extension column, or click the Suggest icon to see the next available extension number in the same range.